Halloysite containing (kaolin-like) mineral plastic clay. Raw Helmer Kaolin clay is a cream-white burning material. We process it in no other way than simple grinding. The raw lump form is comparatively white and clean. In the quarry the seam of clay contains some isolated stringers of darker burning iron material, these are ground and blended with the rest of the material. Mineralogically, Helmer kaolin contains kaolinte and halloysite clay minerals (and small amounts of others of course). Its halloysite content is one of the factors that makes it useful for certain special purpose non-ceramic applications. Plainsman does not currently monitor the mineralogy (e.g. halloysite content) of this material. Helmer Kaolin is prized by potters for its flashing properties during firing (flashing refers to brown and red surface coloration on unglazed areas that develops during wood firing). The chemical or physical phenomena responsible for this behavior has not been clearly explained and there is much disagreement in currect speculation. Helmer kaolin was used for many years in the refractories industry. It was calcined to produce low-quartz thermal-expansion-stable aggregate used to make kiln furniture. 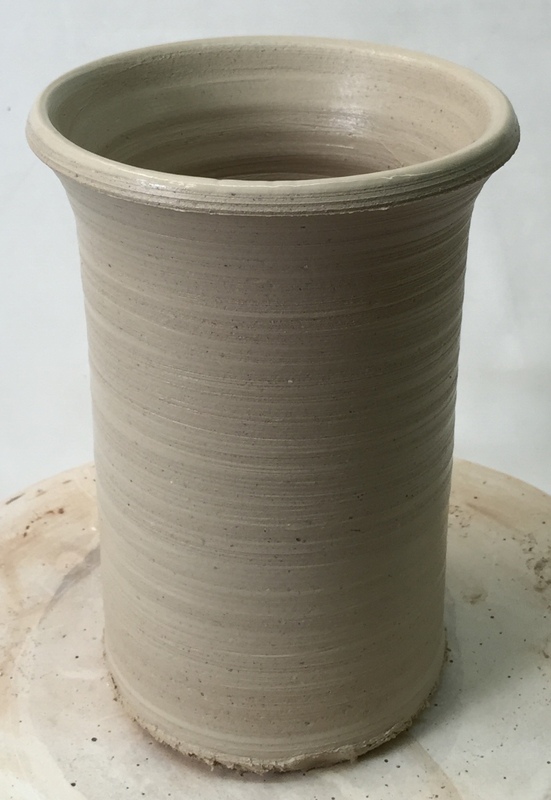 10 mesh Troy clay (Helmer kaolin) freshly thrown cup. In raw form it is yellowy-cream colored and has a plasticity similar to a typical pottery clay. In fact, by itself it throws remarkably well, being more plastic than almost all commercial kaolins. Like any kaolin, it has a high water of plasticity (26-28%) and LOI and it has an ultimate particle size that is significantly larger than ball clays and bentonites. Additions of Helmer kaolin to bodies made from other Plainsman native clays helps diversify the ultimate particle size distribution to produce whiter bodies with better drying properties, greater fired strength, and higher maturing temperatures. 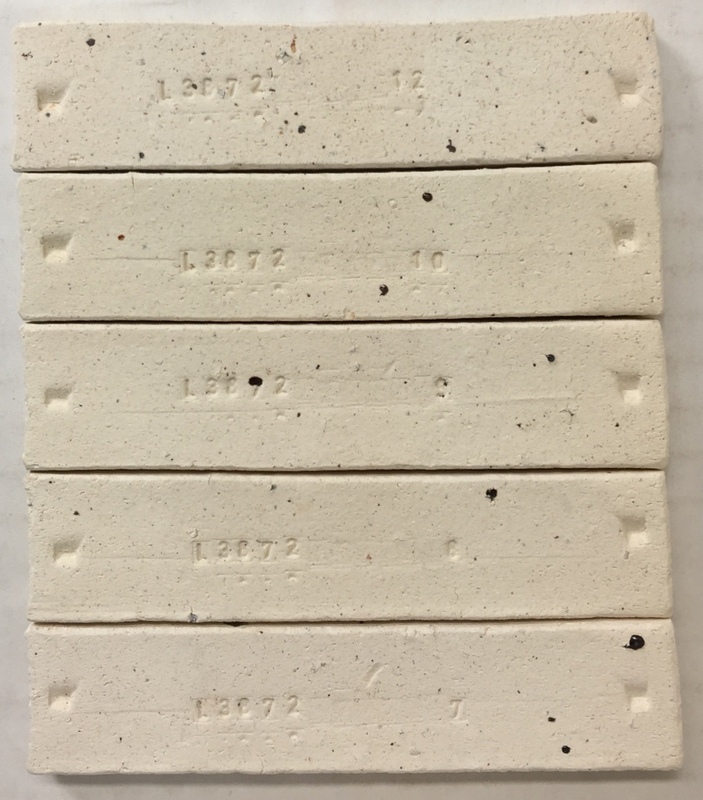 Helmer Kaolin (Troy Clay) fired test bars from cone 11 oxidation (top) down to cone 5, cone 10 reduction (bottom). Helmer kaolin has a fired shrinkage that is higher than typical kaolins, even if fired to temperatures far below its maturing range. This is because of the shape of the halloysite mineral particles it contains and the way these collapse and pack during firing. Thus there is some need for caution as to how much is used in a body (test to make sure it is not adding too much firing shrinkage). Since Helmer kaolin is not ground to 200 mesh as other industrial minerals we do not recommend its use in porcelain bodies (it does contain some impurity harder particles).